The University of Rhode Island is in need of new directions and innovation in its campus master plan for its Field Lab Management Areas – its agricultural and ecological research lands. This project provides that vision. The planning effort of the students for the FLMA demonstrates a critical evaluation of land resources, land use, programming and user groups for a sustainable approach to managing its traditional Land-Grant mission while making it 21st century relevant. Since 1892 the University of Rhode Island has had a proud history as a land grant institution. The land grant universities came into being after a landmark piece of legislation was signed into law by President Abraham Lincoln: the 1862 Morrill Land Grant Act. 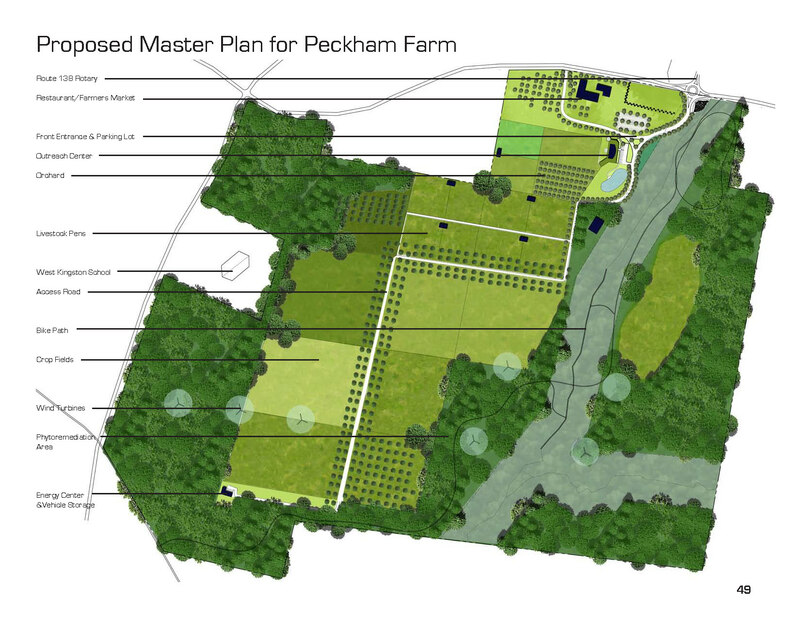 As the university expands and updates its master plan it is necessary to include in the planning discussion those agricultural lands that help give URI its identity and heritage. With a focus on education, research, and extension these lands, known as the Field Lab Management Areas (F.L.M.A. 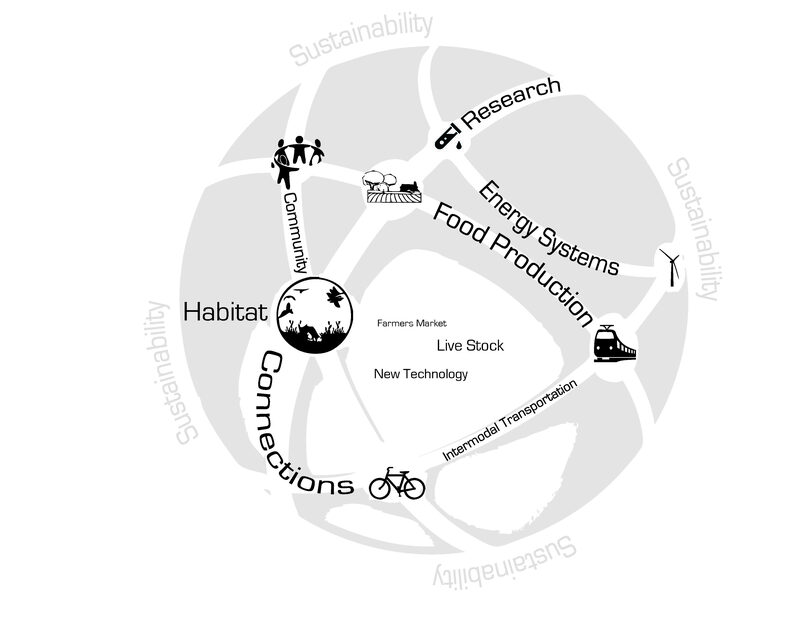 ), are critical to the university’s sustainable future. In an era of rapid development in the nation and especially in the campus sphere this plan advocates for a stronger consideration for the value of open, multi-use, productive and research-oriented agricultural lands. It emphasizes local food production, student-run farms and student-led agricultural research, and addresses a need for sustainable energy production and research at the university level. Practices which can no longer be considered sustainable are replaced with planned agricultural systems and alternative farming approaches. 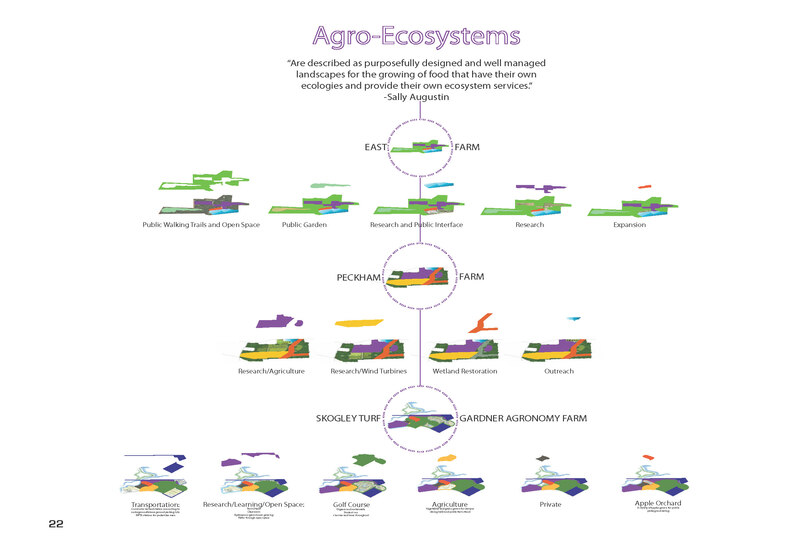 Coupled with an agro-ecological model, this serves to promote sustainable and resilient landscapes with high return value and which provide a multitude of essential ecosystem services. The students investigated the historic and present use of the F.L.M.A. ; researched other leading land grant universities and new agricultural, sustainable and energy production practices; and designed and planned for a flagship education, research and outreach university that includes the F.L.M.A. as an integral part of the university’s future. 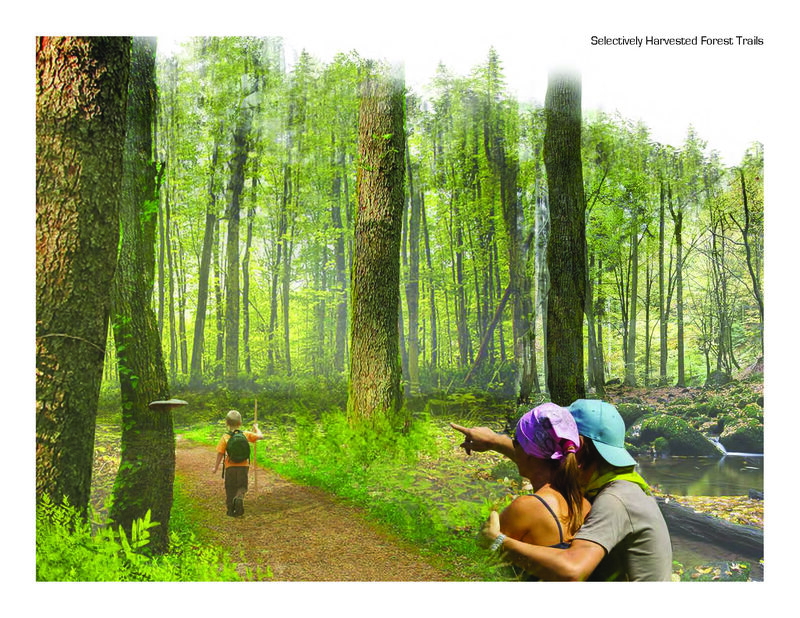 These landscape architecture students were solely responsible for the research, analysis and design throughout the project while seeking guidance from academic advisers and professors. The students took into consideration transportation networks, energy sustainability, ecological niches, functional user groups and current stakeholders in their analysis. The Boston-Providence-New York City transportation corridor was analyzed for connectivity to the campus as well as local bike path access and integration. Topographical analysis, solar exposure, and wind speed data from the RIGIS database were used to determine wind turbine and energy research programs. 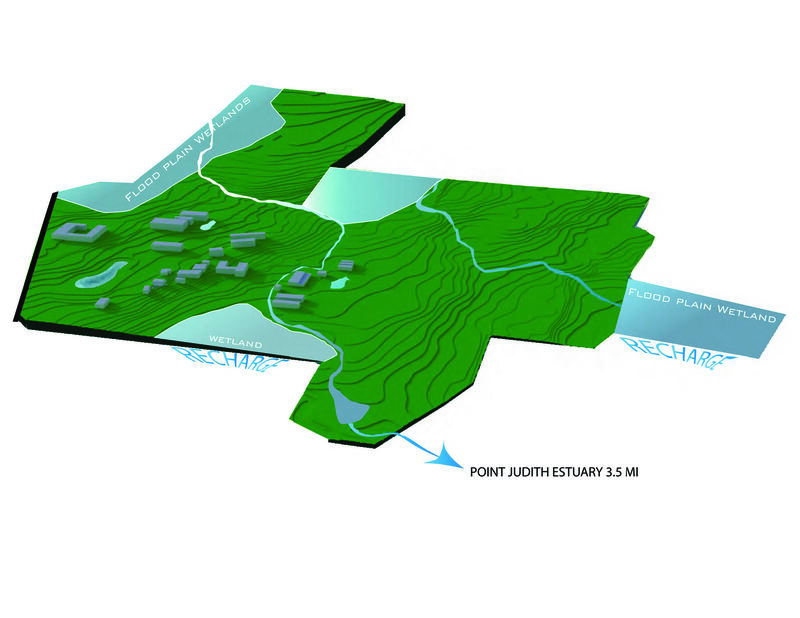 Environmental issues were examined: wetland delineation and watershed boundaries influenced program development and building siting and species dependent ecosystems of Rhode Island along with university research programs and needs drove programmatic development. 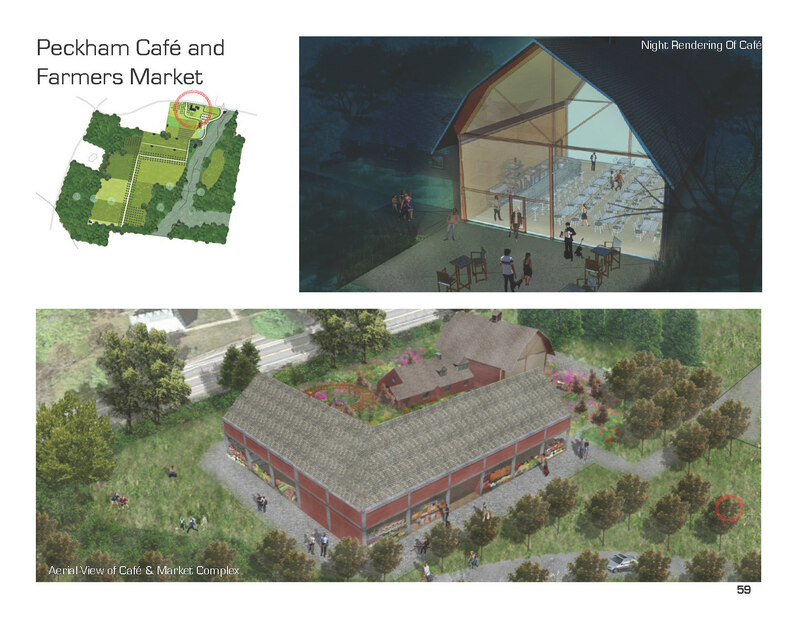 Existing community programs such as the South Kingstown Farmers Market and East Farm Day were examined to relate and integrate the university as an outreach entity and further community connectivity. As part of this process, students conducted interviews and created questionnaires to engage the public in the planning process. They held preliminary presentations, directed conversations, and facilitated meetings with stakeholders and the public. The project takes into consideration the greater effect on the Rhode Island community and economy. By tying into the local bike path the university will be linked to the coastal resources of the state and to the transportation corridor of the commuter rail. The effects of a new planned Amtrak stop at the URI campus are considered for its potential to alleviate new housing concerns for the university. 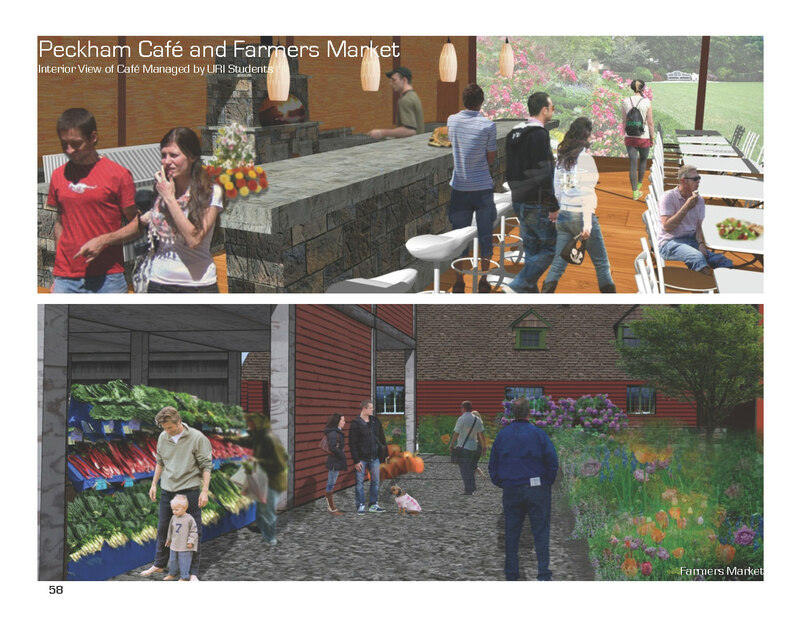 The plan advocates for community space within the university facilities through education and outreach integrated with the amenity of access to fresh food. These student designers used their findings to develop images and graphical analyses, critically examined their findings to determine opportunities and constraints, and held meetings to decide best alternatives for action and execution. 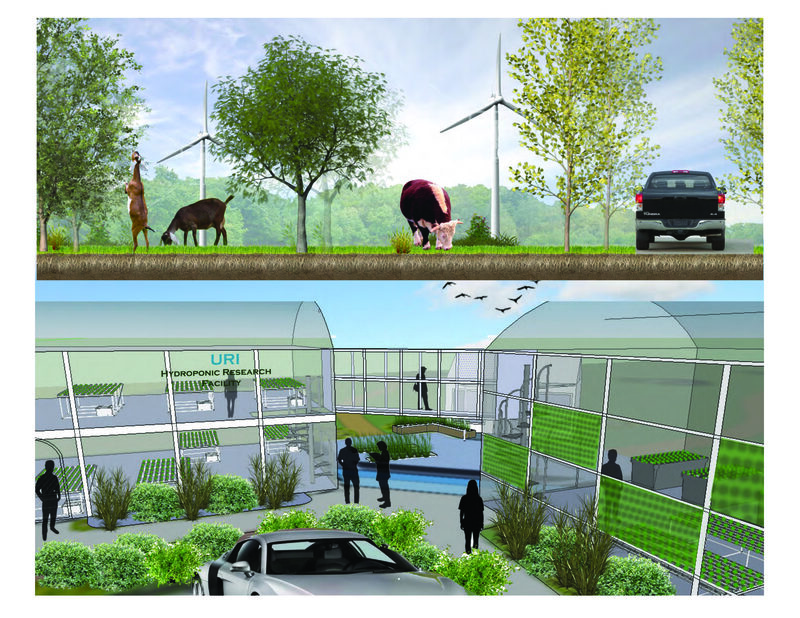 Designs produced from their work include an energy technology center and a student-run local agriculture venue sited on the university’s F.L.M.A., an innovative approach to campus research lands and community integration. In graphic representation these students continue to innovate and push past the abilities of past cohorts leading to an impressive presentation of their skills in current technology as well as solid design. The F.L.M.A. master planning project conceives of a learning institution that surpasses current standards of sustainability and fosters greater student involvement in the university. A planning report was assembled from their research and design which included presentations and executive statements and was presented to stakeholders and to the university. The planning process and the future-thinking agricultural and energy mind set of this document is applicable to other learning institutions within the state and throughout the country. Community involvement, ecological resilience and energy production are relevant and critical topics which should be investigated at all levels of planning as our cities and communities grow. This project should be consulted in future URI master plans as well as transportation oriented design to consider student/commuter housing opportunities within the state. In planning local food production and farm-to-table networks and innovative farming techniques this project is a thoughtful case study. 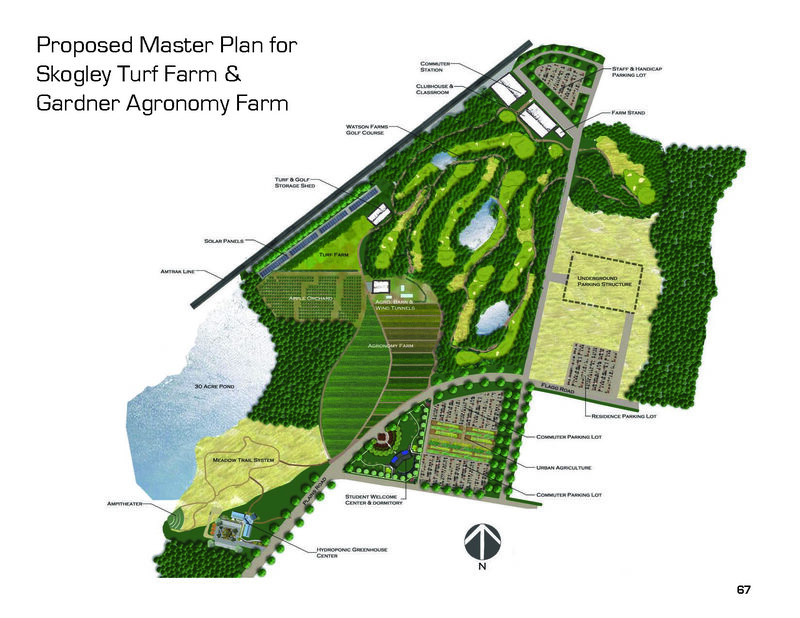 With the presentation of this plan to the University of Rhode Island’s planning department and the College of Agriculture and Life Sciences the students have started the ball rolling for discussion and planning of the Field Lab Management Areas. Their insight and design creativity should start trends at the university and within the state and beyond to consider seriously the importance of productive and research-oriented agricultural landscapes in Rhode Island’s future. The report represents the student design and planning process and is available to the stakeholders and the university. 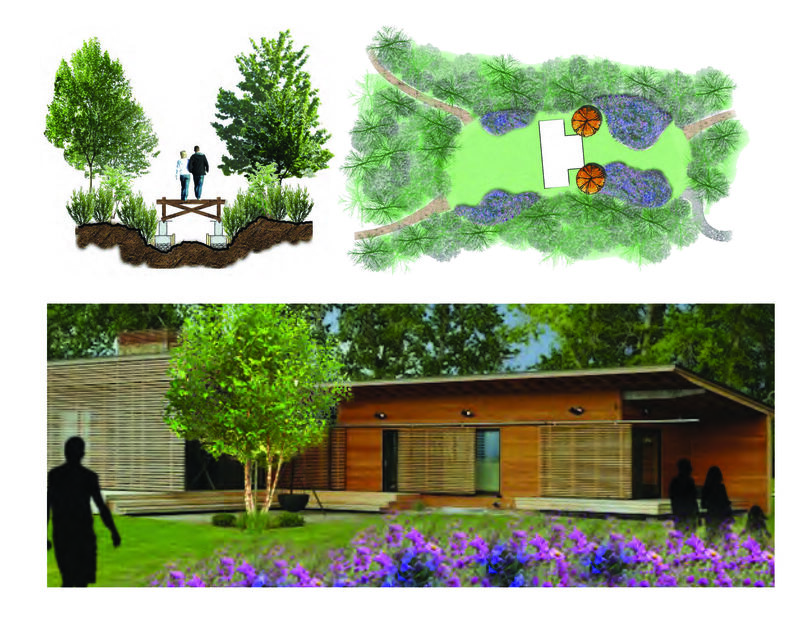 The project demonstrates the ability of landscape architecture as a profession to guide and influence institution-level planning. It shows the commitment of the profession to integrate the community into all levels of the planning and design process and of the profession’s role in planning and developing a sustainable future of Kingston through land and program based design. The level of student involvement and initiative shows the commitment of future landscape architects to these same issues of community and sustainability in design. The designer involvement in the Kingston community strengthens ties to the community and positively empowers the community to have a say in their future. The project envisions new ways of providing for students and researchers to engage with development of sustainable energy and food solutions, particularly in the context of Land-Grant universities. It’s participatory format creates attitude change through its pervasiveness in the university infrastructure and core mission while serving the needs and wants of the adjacent and integrated community. Implementation of the project into the current university master plan is now a matter of outreach and political will within the campus administration. With the motivation of students and community voices change will be effected in the planning and design structure of the University of Rhode Island. This entry was posted in News on December 18, 2013 by rhodeislandasla.